Brother Noah built the ark! We finally have internet in the new (and much improved) apartment, which means I will stop being lazy and start updating on our lives once more. I love craft day with the kindergarten class! The theme last week is transportation, leaving me with a zillion ideas about some cute cut-outs we could do. The kids sing a different song in the morning every week, and for the past five days they’ve been harmonizing about Noah and his ark full of animals. Although I don’t believe in the religious indoctrination of children (anyone really, but especially the young ones), but most of the kids are from Christian families anyway, so I decided we’d make ourselves some arks! The base of our boat was a paper plate, which was cool because it allowed the ark to rock back and forth. 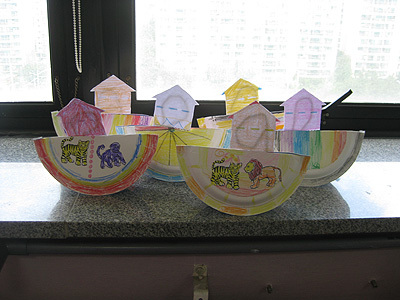 The children colored their boats, and decorated them with little animals from the safari. Purple monkeys, yellow lions and pink zebras — I love when the kiddies get creative with colors. Why is it that when writing is the one thing that lets you feel like your exterior can melt away and everything you’ve bottled up and that’s jumbling around in your brain finally can spill out, rambling and tumbling all over the floor — but sitting down and actually writing is so difficult? I sit down, stare at the computer, then remember the 123,102,213 things I have to do. I need to read Bird By Bird again and remind myself of my priorities! I have been sick. The newbies are here, and after saying goodbye, then saying hello, my body finally got so angry that it just kind of deflated into a sneezy, achy mess this past week — hence, my so rudely ignoring all of you. Aside from working through and helping the new teachers adjust at school, Evan and I found out that we are moving apartments this Friday. Which means packing. And it’s still raining cats and dogs out. Like this. Alas, what must be done must be done, so we’re trying to look on the bright side of leaving our little apartment *tear* and schlepping down the street to our new place. We will miss our home, but this is the beginning of a new home. New adventures! New memories!